This is one of the original set of 3 bellows macro lenses for the Olympus OM system and was first produced in 1972. It was the first lens from any manufacturer that was designed for life-size reproduction with a 35mm SLR camera. Unlike nearly all of the other OM lenses, this one has a preset manual diaphragm instead of an automatic one, and so exposure has to be measured with the lens stopped down. Focusing is easier with the aperture wide open. Like the other 2 manual macro lenses, the aperture scale appears upside down when viewed from behind the camera. This is because this lens was expected to be used pointing downwards on a copy stand or a macro stand, so that the scale appears right way up when viewed from the front. Turn the rubber ring so that the iris diaphragm is fully open; its white dot will line up with the number 4. Turn the metal ring so that its white dot lines up with the aperture that you want to use; the iris diaphragm will remain open. 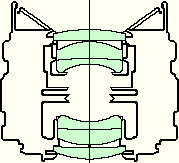 Turn the rubber ring as far as it will go, so that its white dot lines up with the one on the metal ring; this will close down the iris diaphragm. Measure the exposure, and/or take the photograph. The Zuiko 1:1 Macro lens is intended for use with the Auto Bellows, although it can also be used with the Telescopic Auto Tube 65–116 that was introduced in 1980. It can also be used with extension tubes, but with fixed magnifications. It is possible to mount the lens directly on a camera, but it cannot be focused. 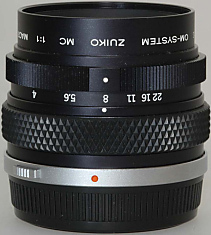 This lens was discontinued in 1981, shortly after the introduction of the Zuiko Auto-1:1 Macro 80mm f/4, which has an automatic diaphragm and a helicoid for fine focusing. A Mirror Housing was made to fit this lens. A hard leather case was supplied with the lens.